The section conducts research on folk life and culture of the people. The monographic study on minor tribes, revision of old monographics, oral literature, brochure of the districts, specialized studies on different aspects are some of the important projects conducted by the section. A thorough survey of the historical places of the state was made prepared and published books and some booklets so far. 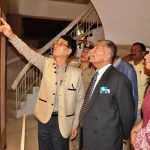 A considerable number of monuments and archaeological sites have been discovered and unearthed by the Directorate of Research at various places of the State in different period. Philological section started to document the Indigenous Languages through publishing phrase books, language guide books and dictionaries through 10 Languages Officers posted in the districts. A total of 150 books and booklet as on March’ 2018 and more than 30 booklets prepared by the Research Officer's of the Directorate are published which are on sale and has earned substantial amount of revenue over year. Arunachal Pradesh is the home to a large number of tribes and sub-tribes. It has a rich tradition of craftsmenship, which manifests itself in various arts and crafts produced by these tribes. The Buddhist including Monpas, Sherdukpen, Aka, Bugun et al make beautiful masks, carpets and painted wooden vessels. This is the Department of Research of Arunachal Pradesh, developed with an objective to enable a single window access to information and services being provided by the department. This Portal is a Mission Mode Project under the State E-Governance Plan, designed and developed by State Council For IT & e-Governance (Dept of IT & C), Government of Arunachal Pradesh & Hosted at National Informatics Centre (NIC), Ministry of Electronics & Information Technology, Government of India.